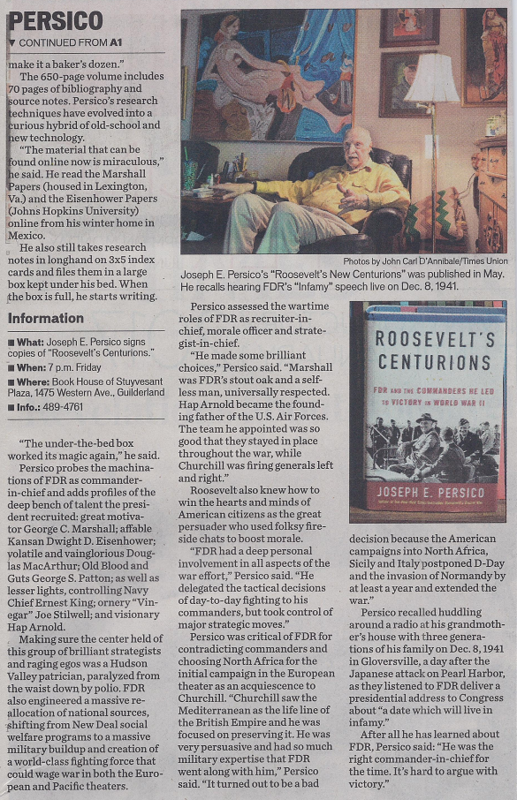 Joseph E. Persico’s latest, ROOSEVELT’S CENTURIONS: FDR and the Commanders He Led to Victory in World War II, has been chosen by the History and Military book clubs as their main selection. Random House: What led you to write Roosevelt’s Centurions? 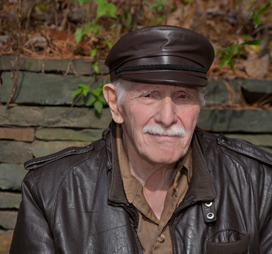 Joseph Persico: I had already written books on the Civil War and World War I. But my overriding interest had always been in World War II. That plus the fact that Franklin Roosevelt had fascinated me – and that I had already written two books about him led me to ask how good a commander-in-chief had he been in the Second World War? RH: And how good was he? JP: That depends on how you rate him in three wartime roles: as Recruiter-in-Chief, as Morale Officer, and as Strategist-in-Chief. RH: Let’s take Recruiter-in-Chief first? JP: In his choice to run the Army, General George C. Marshall, he chose brilliantly. Marshall not only built a puny army to a powerful force, he was also FDR’s sturdy oak on all war time decision. FDR appointed Admiral Ernest King to run the Navy, a crusty old sea dog and a fighter, although Admiral Chester Nimitz would have been just as good. And in Hap Arnold he picked a general who became essentially the founding father of the U.S. Air Forces. Interestingly, his appointees stayed in place from the first to the last day of the war, while Winston Churchill fired generals and admirals left and right. RH: What did you mean by Morale Officer? JP: A wartime president has to inspire the people that the disruptions of normal life, the sacrifice, the inevitable battle deaths are worth enduring. In his speech declaring war on Japan after Pearl Harbor, he stirred the American people vowing that whatever it took, the country would go on to inevitable victory. In his radio Fireside Chats he invited Americans to get out a map and follow the War’s progress with him. He made modest steps to integrate the armed forces, but not enough. His greatest spur to home front morale was the GI Bill of Rights which promised veterans that they would not be forgotten the day they took off their uniforms. Post war, millions of men and women who would have gone back to lower level jobs instead became, doctors, teachers, engineers, lawyers and other professionals because the GI Bill put them through college. RH: And FDR as Strategist-in Chief? JP: He pretty much left the tactical decisions, the day to day fighting, to his commanders. But he took the major strategic decisions into his own hands. For example, he decided to beat Germany first, his insistence on Unconditional Surrender by our enemies, where to invade and when were his decisions. RH: How good were these decisions? JP: It is a mixed record. Beating Germany first made sense because defeating Hitler would eventually mean the defeat of Japan. But defeating Japan would not have meant the defeat of Germany. His launching of the Manhattan Project to build an atom bomb certainly brought Japan to her knees over night. Unconditional surrender is debated to this day as to whether or not it prolonged enemy resistance But if you don’t demand unconditional surrender, then you have to negotiate. And who were we going to negotiate with, Hitler? Himmler? Goering? Goebbels? And these Nazis remained in the saddle until the last days of the War in Europe. RH: Did FDR make any strategic mistakes? JP: His commanders were unanimous in urging an invasion across the English Channel, then across occupied Western Europe and on to Berlin. Against these leaders’ strong objections, FDR decided to put U.S. troops into the European war first in North Africa. Then he again bucked their advice by invading Sicily followed by attacking Italy proper. RH: Why did he buck his commanders to make these decisions? JP: These were campaigns that Winston Churchill urged. Churchill knew that securing the Mediterranean sea lanes would protect the life line of the British Empire. Churchill cleverly pitched these campaigns as militarily sound rather than aimed at preserving the Empire. FDR went along because he was anxious to engage American troops quickly somewhere and saw Churchill as more experienced in mioitary affairs -- a commissioned army officer, a veteran of the Boer War, twice First Lord of the Admiralty and Prime Minister of a country at war well before we entered the conflict. RH: So what was the impact of these questionable decisions by FDR? JP: The campaigns into North Africa, Sicily and Italy, postponed D-Day, the invasion of Normandy, by at least a year. Thus they may have extended the War by that amount of time. RH: So where in your judgment does Roosevelt rank as a wartime leader? JP: All told, taking into account his brilliant choices of commanders, his inspirational leadership of the American people, and despite certain questionable strategic decisions, he was on balance the right commander-in-chief at the right time. It is hard to quarrel with victory. World War II, the largest and most consequential conflict in human history, was the ultimate test of presidential leadership. In Roosevelt's Centurions, distinguished historian Joseph E. Persico shows how President Franklin D. Roosevelt and a cadre of handpicked commanders aced that test, guiding America's armed forces to a smashing victory that was anything but foreordained. Having remade the American economy in the wake of an unprecedented financial collapse, Roosevelt had assured his place in history even before the attack on Pearl Harbor. But America's entry into the fight against the Axis compelled him to focus his formidable political skills on an even more monumental task: assembling and managing a team of proud and sometimes prickly warriors who could execute a plan for victory. Taking us inside the Allied war councils, Persico shows how "Dr. Win the War"—as FDR now styled himself—selected his commanders, brokered strategy with contentious allies, and rallied public support for the war effort. Though often derided for his haphazard management style, the Roosevelt who emerges in these pages is a master delegator with a supple strategic mind who is not shy about overruling the wishes of his military advisors. To complement his portrayal of an active and engaged FDR, Persico offers indelible portraits of some of the outsize figures of World War II, the men who roused the "sleeping giant" that defeated the Axis war machine: the dutiful yet independent-minded Army Chief George C. Marshall, charged with revitalizing a force whose troops trained with broomsticks for rifles and eggs for hand grenades; Dwight Eisenhower, the genial Kansan elevated from obscurity to command the greatest fighting force ever assembled; and the mercurial, vainglorious Douglas MacArthur. Here too are the less widely celebrated military leaders whose contributions were just as critical: the irascible, dictatorial Navy Chief Ernest King; acerbic China expert "Vinegar" Joe Stilwell; and Hap Arnold, an early and zealous proponent of the gospel of air power and its potential to revolutionize modern warfare. What are the qualities we look for in a commander-in-chief? In an era of renewed conflict when Americans are again confronting the questions that FDR faced—about the nature and exercise of global power—Roosevelt's Centurions is a timely and revealing examination of what it takes to be a war leader in a messy, complicated, and tumultuous democracy. "When I was a boy growing up in the South Bronx, my heroes were Roosevelt's Centurions. As a soldier for thirty-five years, I made them my mentors and models. These men were human, fallible, and occasionally vain, but we were certainly blessed to have such Americans leading the Greatest Generation during the world's greatest conflict. Of course the greatest centurion of all was FDR himself, who knew how to lead his commanders, stroke their egos, and get the best from them, yet never leaving any doubt as to who was commander in chief. Joe Persico, my valued collaborator on my memoirs, has brought his formidable talents to bear to bring the Centurions to life. He is at the top of his game in this defining classic." " Joseph E. Persico has done it again! Roosevelt’s Centurions is a riveting, analytic recounting of FDR as top World War II strategist. 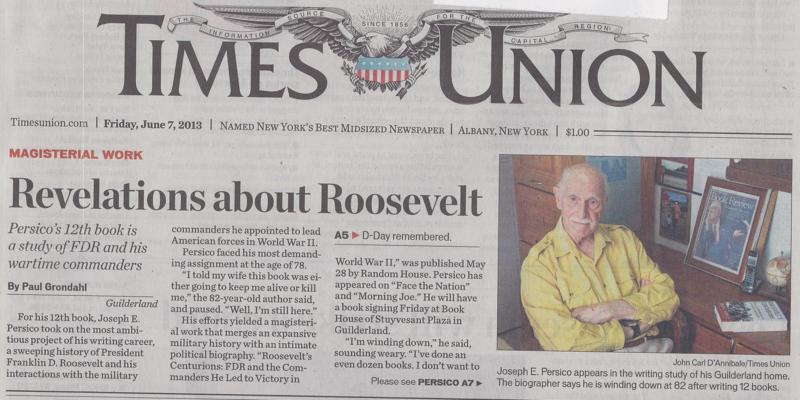 Nobody before has written on Roosevelt as talent scout with the brilliant insight of Persico. I found Persico’s elucidation of the FDR-George Marshall relationship marvelous. A grand book for the ages!" "Benefiting from his years of studying Franklin Roosevelt and his times, Joseph Persico has brought us a briskly-paced story with much wisdom and new insights on FDR, his military liege men, World War II and political and military leadership." "To a remarkable degree we inhabit a world originated by Franklin D Roosevelt - on World War II battlefields, in the gilded halls of diplomacy; above all, inside FDR's fertile, inscrutable imagination. Joe Persico brings all this to life with stunning originality, insight, and narrative drive. Familiar names- Marshall, Patton, Eisenhower, Churchill - are here rescued from caricature. So are the strategic and political decisions that inform today's debate over civil liberties in wartime. The last word on Roosevelt's war, it's safe to say, will never be written. But it's hard to imagine anyone writing any better ones than these." "With rigorous research, a fine eye for detail, and an entertaining ability to recount history, Joe Persico deftly portrays the men behind the man, in addition to skillfully presenting the star himself, FDR, as recruiter-in-chief. A must-read for Americans concerned about war leadership then and now." "Whatever his flaws, Franklin Roosevelt had an eye for talent, according to this sweeping, top-down account of 1939–45 from the point of view of FDR, his cabinet and his leading generals and admirals.. . . Long wars demand long books, but these are 550 pages of lively prose by a good writer who knows his subject. . . . A fine, straightforward politics-and-great-men history." World War 11 Magazine July/August reviews Joseph E. Persico’sRoosevelt’s Centurions: FDR and the Commanders He Led to Victory in World War II. 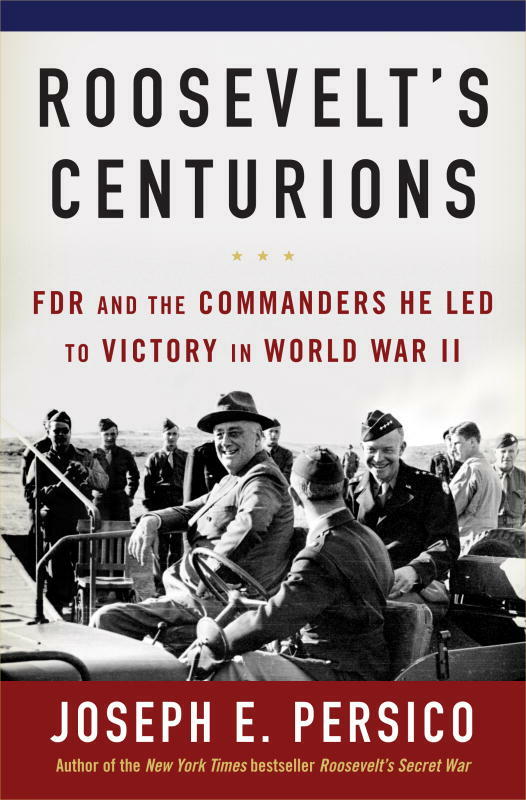 His latest book is Roosevelt's Centurions: FDR and the Commanders He Led to Victory in World War II, published by Random House and on sale as of May 28, 2013. Prior to beginning his career as a historian and biographer, Joseph E. Persico was chief speechwriter for New York governor and later U.S. vice president, Nelson A. Rockefeller. Of Persico's writing career, Eric Sevaried described his Edward R. Murrow: An American Original as "the definitive" biography of the broadcast pioneer. The New York Times said of Persico's The Imperial Rockefeller, "No one has written a book like this about Nelson Rockefeller before." His Nuremberg: Infamy on Trial was described by the broadcast journalist, Howard K. Smith, as "Simply the best account of the trial." This book was adapted by Turner Network Television as a miniseries that won two Emmy awards. Persico was the collaborator on former Secretary of State Colin Powell's autobiography, My American Journey which remained twenty weeks on the New York Times best seller list. His Roosevelt's Secret War: FDR and World War II Espionage also reached the best seller list and was chosen as one of the notable books of the year. His, Eleventh Month, Eleventh Day, Eleventh Hour, on Armistice Day, World War I, has been described by historian, Richard Norton Smith as, "The single finest work I have read on the Great War." The Washington Post's Book World said of his Franklin and Lucy: President Roosevelt, Mrs. Rutherfurd, "Persico... understands that Lucy Mercer helped FDR awaken his capacity for love and compassion, and thus helped him become the man to whom the nation will be eternally in debt." His articles have been published in American Heritage Magazine and the Military History Quarterly. He is a frequent reviewer for the New York Times Book Review and the Washington Post Book World and is a commentator on several PBS and History Channel documentaries.